Start and end in Siem Reap! 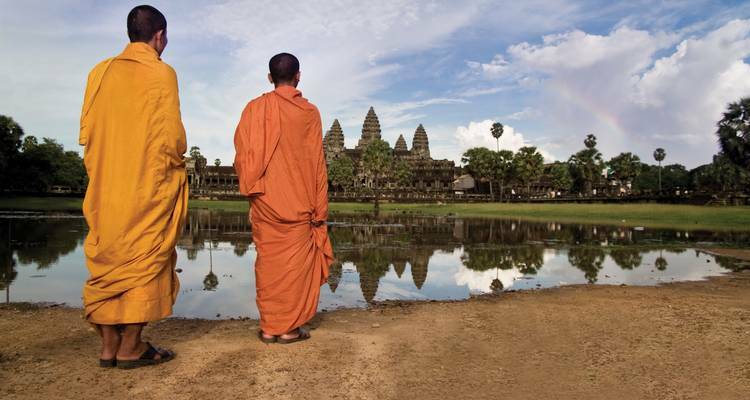 With the discovery tour Ancient Angkor Wat Independent Adventure, you have a 3 day tour package taking you through Siem Reap, Cambodia and Angkor Wat. Ancient Angkor Wat Independent Adventure is a small group tour that includes accommodation in a hotel as well as an expert guide, meals, transport and more. Cheak is a very good guide, he tells us the history of the Angkor Wat and took good care of us. We really enjoyed our time with him in Cambodia. Amazing! Thanks for sharing your kind words about Cambodia and Cheak! Happy to hear you enjoyed your time. Friendly people and very helpful. Really enjoyed the trip since it was my first time in Cambodia. G Adventures has always met or exceeded my expectations and made traveling a wonderful and exciting experience. TourRadar only requires a deposit of $99 to confirm this G Adventures booking. The remaining balance is then payable 65 days prior to the departure date. For any tour departing before 22 June 2019 the full payment of $499 is necessary. No additional cancellation fees! You can cancel the tour up to 65 days prior to the departure date and you will not need to pay the full amount of $499 for Ancient Angkor Wat Independent Adventure, but the deposit of $99 is non-refundable. But, the deposit is fully transferable to future bookings with G Adventures.